This ring is comprised of three polished sterling silver cradles. Nine beautiful handmade tiny glass marbles float freely in the cradles, adding a gentle unique movement to your finger. I created this ring through traditional metalsmithing techniques of sawing, forming, hammering, and soldering sturdy sterling silver. 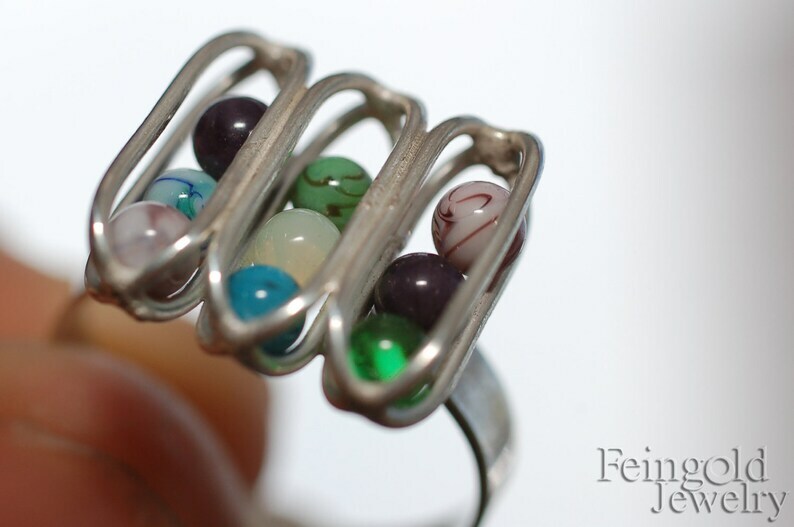 I shined the sterling silver ring to contrast the variety of marbles. The marbles are lovely shades of purple, raspberry, green, blue, turquoise, and milky white. The ring is a size 7.5. The cages measure about 9/16 inch (1.4 cm) wide and the ring measures around 11/16 inch (2.3 cm) long.